The focus of this paper is on two large sequential landslides which formed a dam and the resulting lake that occurred along the Jinsha River on October 11 and November 3, 2018. About 24 and 9 × 106 m3 of material failed and rushed into the river, respectively. Both landslides totally blocked the river and induced hazard chains. Four multi-temporal unmanned aerial vehicle (UAV)-based high-resolution images and digital elevation models (DEMs) before and after the landslides were obtained and merged. The initial deformation of the two landslides can be clearly captured by optical remote-sensing images and interferometric synthetic aperture radar (InSAR) analysis. The depth-integrated continuum method was adopted to analyze the dynamic process of both landslides, using the same basal friction angle and cohesion. The computational results matched well with field measurements and observations. 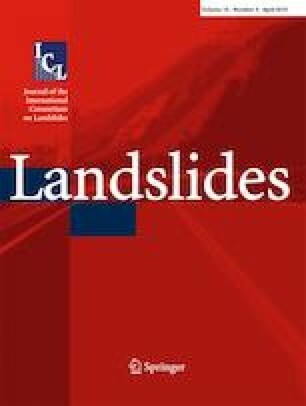 It is shown that the evaluation of potentially landslide-prone areas by the depth-integrated continuum method is feasible and is able to provide significant information before a possible event. The online version of this article ( https://doi.org/10.1007/s10346-019-01177-9) contains supplementary material, which is available to authorized users. Sentinel images were provided by the European Space Agency (EAS). Many thanks for discussions with Yong You and Meng Wang and for help from other colleagues in the field. Financial support from the NSFC (Grant No. 41572303, 41520104002), The National Key Research and Development Program of China (Project No. 2017YFC1501000), the CAS Key Research Program of Frontier Sciences (QYZDY-SSW-DQC006), and the Youth Innovation Promotion Association, is acknowledged.